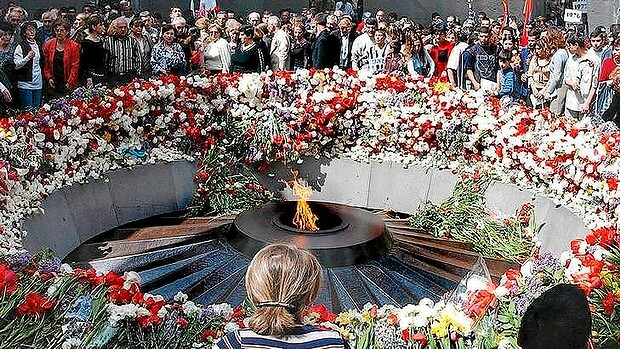 Armenians lay flowers at the Genocide Memorial in Yerevan. Professor Justin McCarthy’s views on the genocide, in which more than one million people are believed to have died at the hands of the Ottoman Empire between 1915 and 1923, have made him a controversial figure. The Labor backbencher who booked a room in Parliament House for a visiting US historian who is accused of denying the Armenian genocide said the controversial academic does not deserve to be silenced. Labor MP Laurie Ferguson booked a committee room on the request of a former constituent for a talk on Thursday afternoon by Justin McCarthy, a professor of history at the University of Louisville, Kentucky. Professor McCarthy’s views on the so-called Armenian genocide, in which more than one million people are believed to have died at the hands of the Ottoman Empire between 1915 and 1923, have made him a controversial figure. Professor McCarthy is held by Armenians in similar low regard as Jews hold Holocaust denier David Irving. In the lead-up to Thursday’s event, organised by the Australian Turkish Advocacy Alliance, the Armenian National Committee of Australia’s executive director, Vache H. Kahramanian, wrote to MPs and senators urging them not to attend the talk by the “noted genocide denier”. “It is abhorrent that the Australian Parliament will be utilised as a venue for McCarthy to spread his denialist views,” Mr Kahramanian wrote. Organisers of Professor McCarthy’s tour had booked venues for him to speak at the University of Melbourne and the Art Gallery of NSW, but both organisations cancelled the bookings after learning of his views. Mr Ferguson said he did not agree with all Professor McCarthy’s views, but “he’s not a denier and I don’t think closing him down would be justified”. 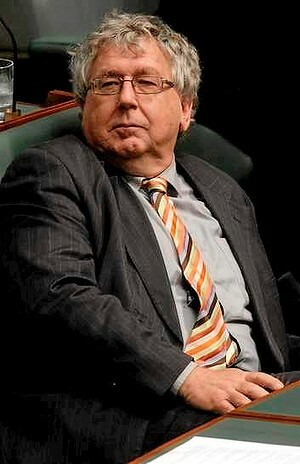 Mr Ferguson said he had been critical of Turkey’s human rights record over a long period of time. “I’m not an apologist for the Turkish government,” he said. Before the event, Greens spokesman on multiculturalism Richard Di Natale said the event should not be held in parliament. “Justin McCarthy is a rallying point for those who deny the Armenian genocide,” Senator Di Natale said. Treasurer Joe Hockey, who is of Armenian descent, as well as Communications Minister Malcolm Turnbull and Labor MP Michael Danby, have previously called for the Australian Parliament to formally recognise the Armenian genocide. The Australian Turkish Advocacy Alliance did not return a call requesting comment.